So my latest obsession is the Onell Design Glyos System. Basically it's a line of highly customizable action figures with this ingeneous set of interchangeable parts that are highly customizable. Anyways, I was at Wal Mart and saw these Wreckit Ralph figures that looked very Glyos-like and were on scale with em. I bought two of em to customized with Glyos bits. This is my first such endeavor. 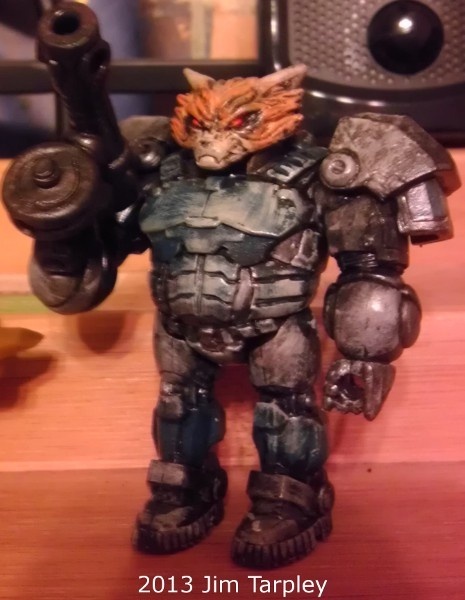 It's the Hero's Duty Ralph figure with a Glyos Armorvor head, forearms are Glyos axis joints with Armorvor hands attached. Gun is various Glyos bits put together to make a gun. Painted with acrylic paints.